One snowy February morning at the Arbors Kids preschool branch in downtown Springfield, Mass., 38-year-old Kejo Kelly crouched low over a large, faded carpet and locked eyes with a blond-haired boy of 3. It was circle time, and Kelly was trying to get each of her 13 tiny students to articulate a feeling. “Good morning, good morning, and how do you do?” she sang softly to the little boy. “Jamal’s silly! Amir’s happy! And how about you?” Kelly’s classroom was known for what one visiting specialist called its “singsonginess.” The good-morning bit was standard fare, but Kelly also sang her own impromptu ditties throughout the day. She’d found that a good melody could cajole even her most obstinate students into completing dreaded tasks: There was a song about washing hands, and one about cleaning up messes, and another about how shouting and running were for outside only. Most children squealed with delight when their turn came to name a feeling: They offered up happys and sillys with abandon. Even the more bashful ones, who had to be prompted, were visibly thrilled by Kelly’s attention, which seemed to beat out a limited toy-dinosaur collection as the class’s chief attraction. But not the blond-haired boy. During the opening exercise, in which each child got a turn to dance in the center of the circle to a song of his choosing, he neither picked a song nor danced to the one Kelly offered. Instead, he flung himself at her feet and writhed like a fish out of water, then went completely still in a belligerent game of possum. Now, at least, Kelly had made eye contact. If any of her students — or “little friends,” as she called them — had sung her song back to her just then, Kelly would have answered that she was stressed. Three teachers had called out from work that morning, including the assistant teacher assigned to Kelly’s room. Massachusetts state law prohibits the child-to-teacher ratio in full-day preschool classrooms from exceeding 10 to 1, so normally, Kelly had 13 students and one co-teacher. But staff shortages were a common occurrence at Springfield Arbors, where teachers earned $10 an hour on average and staff turnover was high. In practice, there was a lot of juggling: On any given day, students and teachers shuffled from one room to another, combining some classes and breaking others up in an effort to keep each room within the permissible ratio. That day, Kelly would absorb six additional students and one co-teacher from another classroom. The extra little ones didn’t trouble her as much as the prospect of being stuck late again. She was supposed to be off by 4 p.m., but most of her kids didn’t leave until 5:30, and the teacher who was scheduled to stay late was among those who were out. Of the teachers who were present, all either had children of their own to fetch from day care or night classes to get to at the community college. Kelly had neither. Her own kids were 17 and 20, and she had long since forgone higher education in favor of working. The ponytailed girl was hardly the only one threatening to break the moment open. Someone was crying. Someone else was throwing toys not meant to be thrown and jumping on toys not meant to be jumped on. Someone smelled like poop and needed to be taken into the bathroom and guided through the basics of toilet use. And several someones were demanding things of Kelly specifically — that she hug them, or carry them round the room on her shoulders, or play a special game with just them. The children were ravenous for their teacher. And for each moment that she focused exclusively on the little blond boy, she risked losing the rest of her class to an irrevocable anarchy. To an outsider, it was tough to say which of the children’s behaviors were normal for 3- and 4-year-olds and which were signs of bigger issues. Increasingly, classrooms like the one over which Kelly presides are being eyed by social scientists and policymakers as both the place where problems emerge and the safety net that stands the best chance of addressing them. Preschool is often thought of as mere babysitting. But a growing body of research suggests that when done right, it can be much more than that. An effective early-education program can level the playing field for low-income black and Hispanic students relative to their white or wealthier counterparts, so much so that gaps in language comprehension and numeracy can often disappear by the start of kindergarten. And according to at least two longitudinal studies, the very best programs can produce effects that reach far beyond those early years, increasing the rates of high-school completion and college attendance among participants and reducing the incidence of teenage parenthood, welfare dependence and arrests. The community Kelly taught in was low-income by all the standard metrics. Many of her students came from single-parent households — some from teenage mothers, at least one from foster care — and nearly all of them qualified for state-funded child care vouchers. Programs like Springfield Arbors that accepted such vouchers received about $35 a day for each child, enough to cover basics like food and art supplies but not enough to pay for on-site behavioral specialists or occupational therapists. The school did make referrals. By Massachusetts law, all 3- and 4-year-olds are eligible to receive special-needs services at the local public school; there is even a free shuttle to shepherd them back and forth. But the waiting list for those services can be long, and in the winter of 2016, few parents at the school bothered to put their children’s names on it. So Kelly kept her own fractured vigil — taking note of which students couldn’t control their emotions, or sit still for the life of them, or engage with others in a meaningful way — and giving those students whatever extra attention could be spared. She sometimes imagined the classroom as a bubble, inside which her students were temporarily spared from the hazards of everyday life. Her job, as she saw it, was to hold that bubble open for the ones who couldn’t always hold it open themselves. The idea that we can deliberately influence the cognitive and social development of very young children is a fairly new one. In the early 20th century, some doctors considered intellectual stimulation so detrimental to infants that they routinely advised young mothers to avoid it. At the beginning of the 1960s, the prevailing wisdom was only slightly less dire. Trying to stimulate a very young mind wasn’t considered dangerous so much as pointless, because 0-to-4-year-olds were “concrete thinkers,” incapable of theorizing or abstraction. But such thinking began to shift with two seminal preschool experiments: the HighScope Perry Preschool Study, which began in 1962 in Ypsilanti, Mich., and the Carolina Abecedarian Project, which began in 1972 in and around Chapel Hill, N.C. Perry provided free half-day classes and weekly home visits to 58 black children living in a high-poverty district near Detroit. Abecedarian provided 57 children of a similar cohort with full weekday care for their first five years of life, including not only preschool but also health care and social services. Both programs employed highly trained teachers and kept student-to-teacher ratios low. The Perry study also used a curriculum rooted in “active participatory learning,” in which cognitive and social skills are developed through educational games that the children themselves initiate and direct. The short-term results of these interventions were mixed. Some of the preschoolers, for example, were more aggressive at the end of the programs than they had been at the start, even if this difference disappeared by second grade. Decades later, however, when researchers went back, they found a surprise. At age 21, the Abecedarian children were half as likely to have been teenage parents and 2.5 times more likely to have enrolled in college than the control group, who did not attend preschool. At 40, the Perry children had higher median incomes than their control-group peers; they were less likely to be on welfare and less likely to have been arrested. Those results were not uniform. For example, while Perry seemed to reduce arrests and increase high-school graduation rates, Abecedarian had no impact on either. But the findings still caused a stir among social scientists and educators: Both programs appeared to have affected the children in ways that could still be seen in adulthood. In the decades since those results were published, the biological and social sciences have radically altered our understanding of early-childhood development. We now know that infants and toddlers have the capacity for complex thought. According to a recent report from the Institute of Medicine, they can understand other people’s intentions, reason about cause and effect and intuit the more basic aspects of addition and subtraction. We also know that the earliest years are a period of intense and rapid neural development — M.R.I. studies suggest that 80 percent of all neural connections form by age 3 — and that a child’s ability to capitalize on these years is directly related to her environment. Social scientists have shown that, owing to a shortage of books and toddler-friendly conversation, children from families on welfare understand roughly one-third the number of words that their middle-class peers do by the start of kindergarten. 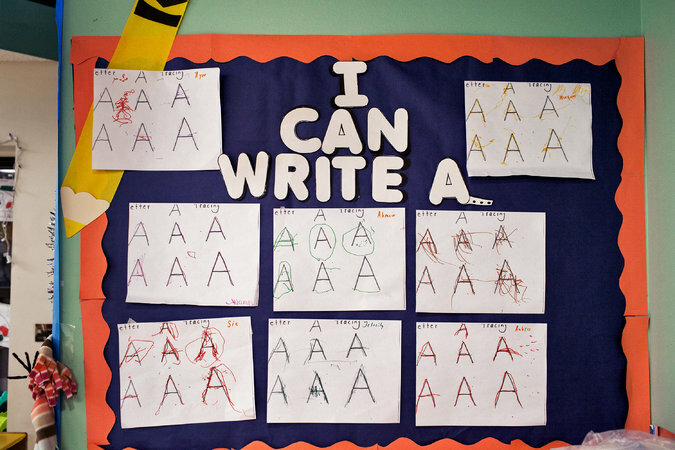 Part of the problem is that the benefits of a preschool education tend to manifest unevenly. 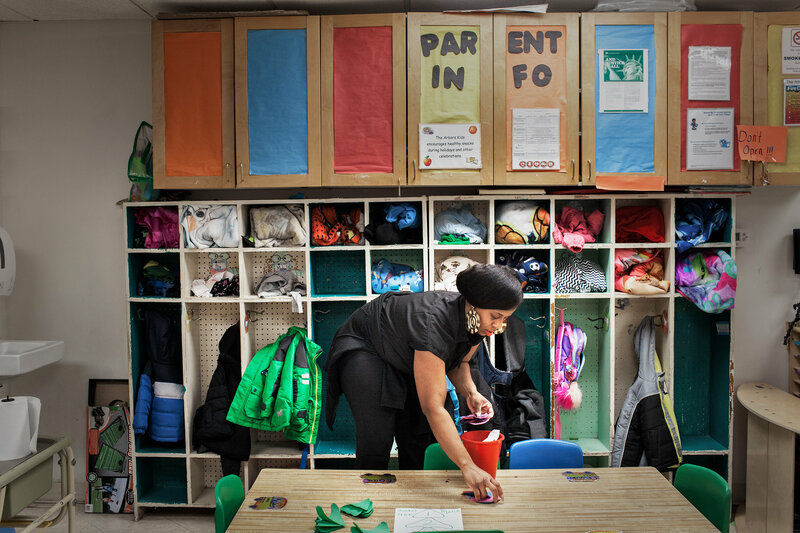 Developmental gains made by the start of kindergarten can be enough to close racial achievement gaps, but those gains often evaporate by third or fourth grade, a phenomenon that education researchers call the fade-out effect. And so far, the longer-term rebounds found in Perry and Abecedarian — in which children who attend good preschools fare better in adulthood than their peers who attend no such program — have been difficult to parse or replicate. In 2017, a group of prominent early-education researchers published a consensus statement declaring that preschool classrooms were a “black box” and that much more research was needed before anyone could say with certainty which ingredients were essential to improving long-term developmental trajectories. Amid that uncertainty, though, at least two things seem clear: Children in low-income and minority neighborhoods stand to gain (or lose) the most from whatever preschool system we ultimately establish. And the one-on-one exchanges between students and teachers — what developmental psychologists call “process quality” — may well be the key to success or failure. In other words, if preschool classrooms really are crackling with the kind of raw power that can change the course of a life, that power most likely resides in the ability of teachers like Kelly to connect with students like the little blond boy. The solution to this paradox seems obvious: Hold preschool teachers to the same standards as their K-12 counterparts, and pay them a salary commensurate with that training. But that proposition is rife with intractable questions. Who will pay the higher salaries? How will current teachers rise to meet the new credential requirements? And if they can’t or won’t, who will take their place? At the heart of those questions is this one: What, exactly, makes a good preschool teacher? It was the crowning moment to a much larger project that began when the children noticed that it was getting colder out and that the leaves were changing color. Lopez led them through a dialogue about how trees and other plants get ready for winter. From there, they turned their attention to what animals do. Lopez took the class to a local park, where they noticed squirrels collecting nuts and looked for birds who might be getting ready to migrate. In the end, they circled back to themselves, discussing sweaters and warm coats and winter boots. “We introduced some big concepts,” Lopez told me when I visited her class recently. “And it all started with that one simple question: ‘What do you see happening around you?’ ” The technique was called scaffolding, and it was a key tenet of current preschool pedagogy, which Lopez learned as a student teacher. Those figures have made Abbott a lightning rod in the debate over public preschool in general and teacher credentials in particular. Critics say that the program is far too expensive given how little it may affect student outcomes in the long term (Abbott studies show fade-out effects, albeit less significant ones than in many other preschool studies). But proponents argue that it’s unfair to judge the success or value of such programs by performance in the middle-school or high-school years — in part because there may be rebound effects later on. And in any case, the program works demonstrably well in achieving its primary objective: preparing children for elementary school. It has also helped stabilize the preschool work force. Because Abbott teachers earn solid middle-class salaries — between $55,000 and $57,000 per year on average — staff turnover is less of a problem, which in turn means that classrooms are less chaotic. From there they discussed how barreling into a person might make that person feel. Eventually the boy concluded that it was best to save fast running for outside, where there was more space. It was as good a lesson in physics and feelings as any 4-year-old was likely to get, in any school. But later that day, the same little boy found himself puzzling over another riddle of movement and speed. It was recess, and the class was scattered across the narrow strip of wood chips and strewn toys that constituted the Springfield Arbors playground. The boy in orange shorts huddled with three other boys in a cubbyhole at the base of a plastic fort. The group whispered and drew in the dirt with twigs for several minutes before abruptly bursting out across the yard. They took possession of a large rubber ball from some uninterested girls and set about throwing it as high as they could. The boy in the orange shorts took several consecutive turns, throwing the ball higher each time. When it landed atop a tarp that was fastened to the side of the building, the boys exchanged giddy confused looks: Why had the ball landed there instead of on the ground? What should they do next? The boy looked across the playground toward Kelly, but she was busy brokering a time-share deal between two archrivals over the class’s only Malibu Barbie. If there was a shortcoming to Kelly’s work, it was that her skills were almost always deployed to resolve a crisis or defuse tension, and rarely to nurture some budding curiosity. Kelly didn’t doubt the vastness of her students’ inner mental worlds; nor did she discount the importance of meeting them where they were or of treating them with frankness and intelligence. In fact, she seemed to grasp those principles intuitively. What she lacked was the support she needed to build on her natural talents or cultivate her own ambitions. That feeling had become more pronounced lately, owing to a string of incidents outside the classroom. First was the robbery: When she and her daughter stopped at the bank one evening after work, they were held at gunpoint by a man in a ski mask demanding all the money behind the counter. The entire episode passed in 15 minutes. But while Kelly’s daughter compartmentalized it quickly, Kelly replayed it in her head for weeks, enumerating to herself all the ways that trouble had nearly missed them: She did not normally stop at that branch, but had taken a different route home to run an errand. They had been about to leave; Kelly’s hands were on the door when the gunman came through it from the other side, thrusting his weapon in her face. He was never caught, but the Springfield Police Department sent the Kelly household a pamphlet on how to deal with the aftermath of a robbery. Then, as summer approached, Kelly received a summons asking her to testify in a murder trial. The actual killing took place in 2013, on her brother’s birthday. It was the first of his birthdays since his death, and Kelly and her sister were sitting up in her sister’s kitchen, weathering the internal storm that such anniversaries tend to bring, when they heard shots. Kelly looked down from the second-story window to find a gaggle of teenagers, including her nephew, scrambling for cover. She grabbed every glass object she could get her hands on — plates, vases, dishes — and hurled them out the window at the gunman, ducking in between throws to protect herself. When the shooting stopped, she and her sister ran out to the street, where they found one boy down. Kelly gave him CPR, and even got him back to breathing for a few minutes, but he died before the ambulance arrived. In addition to reminding her of that day, the court summons had the effect of putting her children on edge; there had already been more than one shooting in their neighborhood that summer, and it was never good to be the only person standing between an accused killer and a possible life sentence. Kelly prided herself on setting those worries aside when she was at work. But with each fresh calamity, she felt the walls of her own bubble closing in. One late afternoon, as fall tipped into winter, a squirrel perched itself on the ledge just outside Kelly’s classroom window and caught the attention of a small boy with milk-chocolate skin and big, round eyes. He pointed at the animal, silently but with gusto. When Kelly walked by, he tugged at the leg of her pants. She scooped him up, rested him on her hip and, for a brief moment, watched with him as the creature scurried up and down a tree at the playground’s edge. “Yes,” she said. “That’s a squirrel.” The boy continued to point, but it was late in the day, and Kelly was tired and distracted, so the conversation ended there. In the fall of 2017, Kelly and her colleagues received word that Springfield Arbors preschool would change owners this January, and become Bright Futures. No one could say for sure what that meant for the teachers or their students. The anxiety surrounding this change reflected an uncertainty that reached far beyond Kelly’s classroom. 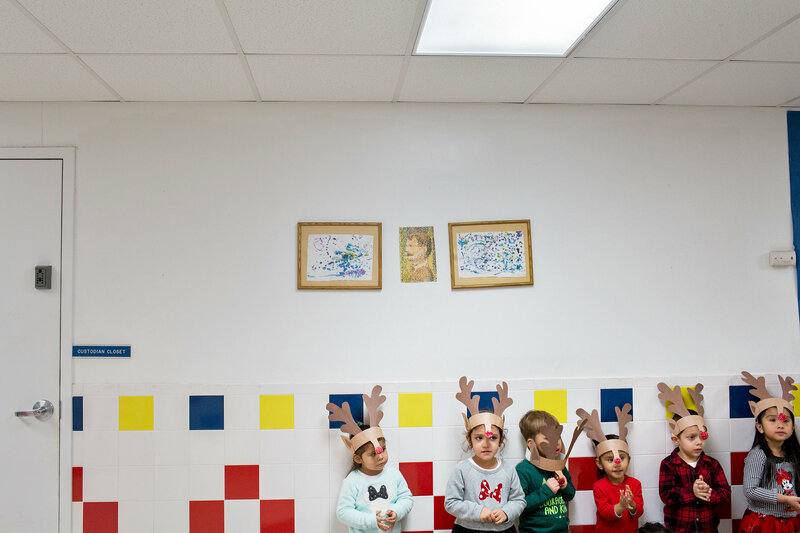 In the last decade or so, the percentage of children served by state programs has doubled; 43 states and the District of Columbia now have public preschool programs of one kind or another. But that recent progress is now being tempered by federal indifference: The Secretary of Education, Betsy DeVos, has yet to appoint a director of the Office of Early Learning, established under the Obama administration to help facilitate the integration of preschool into the public-education system; and President Trump has eliminated preschool funding increases from his proposed budget. What’s more, experts are still divided over what credentials early childhood educators should have. 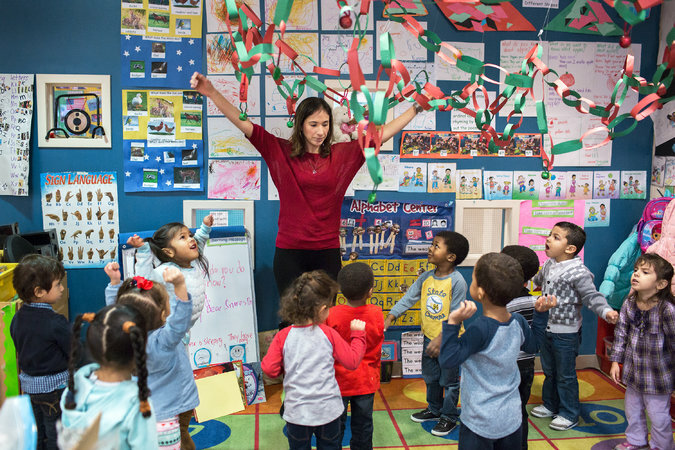 A Philadelphia-area community college, a union and a number of local preschools joined forces to make the first attempts at training preschool teachers in this way. The program pairs apprentice teachers with mentors as they progress through a structured curriculum while working in the classroom full time. They get four wage increases over a two-year period, so that by the time they complete the program, which grants them both an associate degree and a journeyman card, they are already earning $2 to $3 more an hour. “That’s a life-changing increase,” McCarthy says. It will take a few years more to say how the apprentice program stacks up against programs like Abbott, or even like Springfield Arbors, and if the teacher training affects student outcomes in any measurable way. And then individual communities will have to decide if the gains are worth the price. “We have to come to terms with the fact that this is going to cost a lot more money,” O’Leary says. “And to accept that, I think we still have to shed a lot of prejudices about working mothers and the working poor, and what it means to help them.” In the meantime, with limited funds, policymakers and educators are caught between competing imperatives: Use the money they have to expand access so that as many students as possible receive some form of early education, or use it to improve quality in specific places like Six Corners, where both the need and potential payoff are greatest. For now, Kelly and hers were making do. Her son was accepted at six of the 10 colleges he applied to. He had qualified for some scholarship money, which would help bring his tuition down, but Kelly was scrambling to come up with the rest. She had found a second job working nights and weekends at Kohl’s, and was cutting corners where she could. One such economy was her car: a 2001 Buick Park Avenue, bought from a friend for $700. The engine was solid, but the gas meter was busted, so that you had to pay very close attention to the amount of driving you did relative to the amount of money you had put in the tank, or you’d end up stranded. Kelly learned this the hard way one evening. After a day filled with staff shortages and screaming children, she was heading through Six Corners toward home when the car sputtered to a stop. Both snow and darkness were falling fast, but there was a gas station just two miles up the road. Kelly called her daughter to say she’d be home late. Then she fished a plastic container from the trunk, hunched her back against the cold and set out for the long walk by herself. Posted in Funding For Education, Pension & Salary and tagged "Standing Strong for Public Education", #iBelieve, Accountability, Accountability System, Advocacy, Department of Education, Diversity, Education, Education Funding, English Language Learners, Equity, Every Student Succeeds Act (ESSA), Failing, Failing Schools, Federal Education Policy, High-Needs Students, NEAExecutiveCommittee, Pension, Pensions, Public Education, School Choice, Students, Testing and Accountability. Bookmark the permalink.